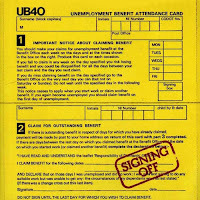 UB40 have been responsible for some terrible crimes against music over the past three decades, but before they were moaning about a girl running off with their “colour TV” and their “CD collection of Bob Marley”, they were deeply engaged in political protest and shed a stark light onto Thatcher’s Britain. Growing up on a council estate in Wolverhampton during the 1980s, the music of UB40 seemed part and parcel of everyday life, and particular songs would be perfect for any given social situation: ‘Kingston Town’ would always crop up at weddings; birthday parties might feature the 808 State remix of ‘One in Ten’; and Saturday night gatherings might include a drunken sing-along with their cover of ‘I Got You Babe’. Perhaps it was to do with the affinity that Midlanders had with their local heroes, or perhaps it was that UB40 sung about issues that that people living on the estate could related to: mass unemployment, the rise of Thatcherism, racism, alienation, and a feeling of anger at the injustices of the world around them. Album-opener ‘Tyler’ tells of the alarming case of a 16 year-old American student who was returning home from school by bus in 1974 and was attacked by a mob of around 100 pro-segregationists. During the scuffle, a 13 year-old bystander was shot, and though no weapon was ever found, Tyler was sentenced to death for his murder (this has since been reduced to life). There is much inconsistency and controversy surrounding the case, which led to Amnesty International declaring Tyler’s incarceration as a racially-motivated miscarriage of justice, and the organisation have given Tyler the status of a political prisoner. In telling this tale, the music is mournful yet melodic, and Campbell’s vocals seem to burst with anger and frustration. ‘King’ - a song about the loss of Martin Luther King - is a rich, reverb-soaked reggae track that utilises pop melodies to speak about racial tension, and King’s followers’ loss of direction: “You had a dream of a promised land / People of all nations walking hand in hand / But they`re not ready to accept / That dream situation, yet”. The politics are left aside during the instrumental track ’12 Bar’ with its dub-tinged echoic sounds, warm saxophone solos, and a bouncy bass-line. ‘Burden of Shame’ is held together by a dark, moody bass-line that seems to echo the tones of the guilt-ridden lyrics: “As a nation we`re following blindly / No-one stops to question why / Our money`s supporting an army / And a boy in Soweto dies / I`m a British subject, not proud of it / While I carry the burden of shame.” This might come across as rhetorically similar to Green Day’s ‘American Idiot’, but the songs couldn’t be more different. Whereas ‘American Idiot’ is inspired by rebellion for its own sake, Campbell’s vocals are poignant and intelligently considered: these aren’t simply words to drive a pop song – this feeling of shame and powerlessness is genuine and heartbreaking. 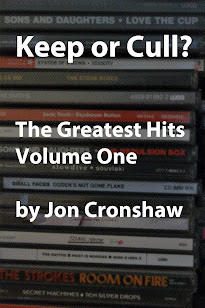 Respite comes with the tracks that follow: the cheery instrumental ‘Adella’, with its bright chord changes, gentle Hank Marvin-esque guitar noodling, and a springy bass hook laid over reverb-soaked snare shots; ‘I Think it’s Going to Rain’, which is probably the softest song on the album, and points to their future direction that would come to fruition on Labour of Love; and the dubby instrumental ‘25%’ which has a saxophone solo that can’t help but bring to mind the theme music to Men Behaving Badly. The album-closer of the original vinyl release, ‘Signing Off’, is another instrumental with a skanky bass hook that ends the record on a high. 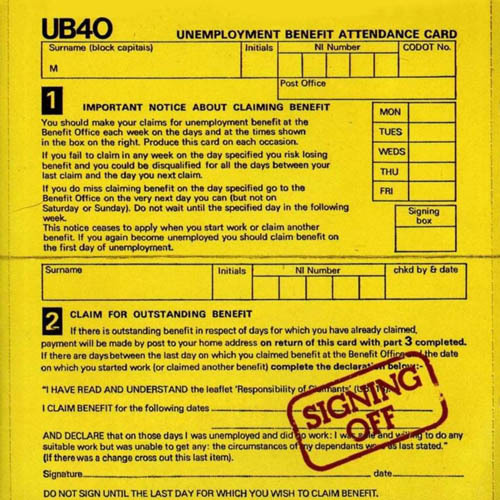 The album was repackaged with an extra three tracks in 1984, and features some of UB40’s best work. There is a dark and gloomy reggae reinterpretation of Abel Meeropol’s ‘Strange Fruit’, a song made most famous by Billie Holiday’s haunting rendition. ‘Reefer Madness’ is instrumental with an almost frenetic rhythm that seems to lean more towards the madness than the reefer. The album closes with one of UB40’s most accomplished pieces of music. At almost 13 minutes in length, ‘Madame Medusa’ is a scathing attack on Margaret Thatcher: “From the tombs of ignorance / Of hate and greed and lies / Through the smoke of sacrifice / Watch her figure rise / The sick the poor the old / Basking in her radiance / Men of blood and gold.” Indeed, the final seven or so minutes of the record are more than a political diatribe, but are an actual call for arms: “Knock her right down / And then she bounce right back / She gone off her head / We've got to shoot her dead” – I’m sure this was meant metaphorically. Signing Off provides a snap-shot of British social history that captures a sense of helpless frustration at “a world that doesn’t care” that feels only too poignant and relevant today. An excellent album. This article was published by Sabotage Times.